Jennifer Aniston is an American actress, director, producer, and businessperson. She is the daughter of Greek-born actor John Aniston and American-born actress Nancy Dow. 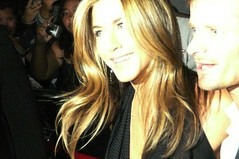 Jennifer is married to actor and filmmaker Justin Theroux. Jennifer’s father was born with the name Yannis Anastassakis, and was a friend of actor Telly Savalas. Savalas was Jennifer’s godfather. Jennifer’s mother was of one quarter Italian-Arbëreshë (Albanian), as well as of Scottish, and some English, descent; some of her ancestors were from Canada. On Inside the Actors Studio (2011), Jennifer stated that her mother also had Irish, as well as “a little splash of Greek”, ancestry; it is not clear where on her mother’s family tree Greek ancestry came from. Jennifer’s great-grandfather’s surname, Grieco, is a variant of the Italian surname Greco, which literally means “Greek”. The name may occur among the Arbëreshë. Jennifer’s paternal grandparents were Antonios J. Anastassakis and Stella A. Joanna Koume/Mazethek (the daughter of Marcus Koumis and Katina Piplaki). Antonios and Stella were born on the island of Crete, Greece. Jennifer’s maternal grandfather was Gordon McLean Dow (the son of Francis Dow and Ellen Sarah McLean). Gordon was born in Houlton, Maine. Francis was born in St. Stephen, New Brunswick, Canada, to a Scottish immigrant father, James Dow, and a mother of Scottish descent, Katherine Stewart. Ellen was born in St. Francis, Maine, the daughter of Neil McLean and Mary Henderson; three of Ellen’s grandparents were Scottish immigrants, while Ellen’s maternal grandmother, Sarah Ann Diamond, was born in Campbelltown, New Brunswick, to American parents, who were descended from English immigrants of the Colonial American period. Jennifer’s maternal grandmother was Louise Mae Grieco (the daughter of Louis Grieco and Mae/May I. Dunbar). Louise was born in New Jersey. In U.S. Censuses, Jennifer’s great-grandfather Louis lists himself as having been born in either Italy or New York; on the 1920 and 1930 U.S. Censuses, Louis states that his parents were born in Albania and spoke Albanian. Jennifer’s mother Nancy wrote in her book, From Mother and Daughter to Friends: A Memoir, that Louis was born in Mèlito, Italy. It is likely that his family was from the Arbëreshë community (ethnic Albanians who lived in Italy). Jennifer’s matrilineal great-grandmother Mae/May I. Dunbar was born in Pennsylvania, to parents who were also born in Pennsylvania. It is unclear what Mae’s ancestry was. The surname Dunbar is usually found in Scotland and England. So I guess the issue is solved. 1910: Born in Italy. Parents also born in Italy. 1920: Born in Italy, spoke Albanian. Parents born in Albania, spoke Albanian. 1930: Born in New York. Parents born in Albania. If he was ethnically Italian, he would’ve never listed his language as Albanian or his parents’ birth places as Albania anywhere, it would say Italy and Italian everywhere. Just because the information varies doesn’t make it more uncertain in my book. The birth places and languages for ethnic minorities sometimes vary between their ethnic homeland and their birth country, or between different sized entities (like Russia and Ukraine). In my opinion, it should only say “Arbëreshë/Albanian”, not “Italian or Arbëreshë/Albanian”. There are two Melitos in Italy, one in Campania and one in Calabria. I suppose that her ancestors came from Melito (di Porto Salvo), Calabria, where there’s still a tiny Greek-speaking minority (also known as Griko people), rather than Arberesche. Probably not, everything points towards Albanian ancestry, no evidence for Greek except an ambiguous surname. Yes, “Grieco” does not imply (recent) Greek ancestry. Btw ancient Romans, and Italians still do nowadays, used to say “Nomen (est) omen” (name is a sign), so there must be some Greek ancestors further back down the line. She refers to her grandfather (Jennifer’s great-grandfather) as “a hardworking Italian immigrant”.